Select Organization and press Authorize button. Load Deputy Page in Simplepay.ca. Under Manage Employees panel, number of employees created in Deputy will be listed which are not imported in Simplepay.ca. Click on Import Employees button. Employee's data will be loaded in editable form. Select Employees which you want to import. Only First Name, Last Name and Date of Hire is available from Deputy and this information is populated. Enter data in all required fields and press Save button. Employees will be imported into Simplepay.ca. 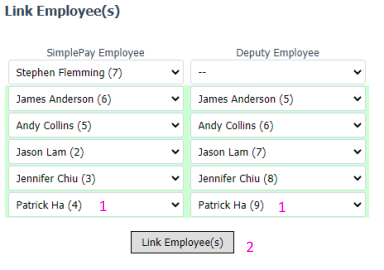 You can import timesheet data only for employees who are imported from Deputy. Select pay period type (in case of multiple pay period types in company). Available date range for Timesheet data import is given. You can select to import Timesheet as Hours Worked or Time In Time Out format. You can also select whether to import Approved/Unapproved/Both timesheets from Deputy. Press import data button to import timesheets from Deputy. Status message will be displayed for Timesheet imports. You can check the imported timesheet data in Payroll page and Timesheet page.